It seems a little unfair to encumber an exhibition with a title like OK Great REALLY this is ALSO RIDICULOUS. With its overtones of exasperation and disparagement, the phrase sends confusing signals about what’s in store and how seriously to take it. But the show hooks you in an instant and holds you for a good, long time. The DCKT edition presents fewer than half of the artists included in LA, but it seems custom-made for the gallery’s more intimate confines, especially the way Cordy Ryman’s painted relief ensemble “Pascal’s Fourth Fall” (2014) fills the entire back wall. Each object — whether it’s a terra cotta and earthenware sculpture by Nicole Cherubini (“Morning Star,” 2012) or a found object assemblage by Jessica Stockholder (“[JS 531],” 2012) — feels perfectly positioned on the wall or floor, with correspondences and echoes zinging back and forth across the room. Cordy Ryman, “Pascal’s Fourth Fall” (2014), acrylic & enamel on wood, dimensions variable: 117 x 106 x 5 inches as installed. As a summer show, OK Great seems to have just the right amount of everything — the familiar, the boisterous, the unexpected and the absurd, with a distinctly smart, distinctly anarchic curatorial vision guiding it. Super-hot, citrusy colors abound, putting a premium on visual buzz, but not for its own sake. Rather, the excitement generated by these works, mostly by artists in their 30s and 40s, seems more focused on constructing an interstitial space where formalism can reside amid lush textures and saturated color, a hedonistic rigor that draws its strength from the gestural manipulation of its materials. By gestural I don’t mean arm-swinging sweeps but the small gestures imparted by the wrist, hand and fingers — the work is funky in the way that only handcrafted objects can be. Along with Ryman, the show includes two other artists I’ve written about before, Trudy Benson and Russell Tyler, whose rambunctious works play well with others, especially Cherubini’s sculpture and two untitled paintings from 2012 by Tucker Nichols. Nichols, who is in his early 40s, supplies the scruffy quotient prevalent among many of his anti-finesse peers with two faux-pedestals for his still life paintings (quirky silhouettes suggesting flower-filled vases) made out of roughly cut, unpainted sheetrock screwed to the wall. The other works in the show are a little more polished, but in degree rather than in kind. 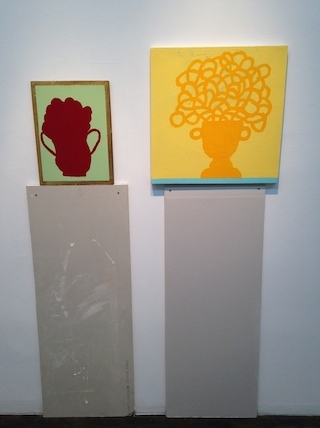 Tucker Nichols, “Untitled” (2012), mixed media, panel, 15 3/4 x 11 3/4 inches; overall, 58 x 16 inches; and “Untitled” (2012), enamel and acrylic on canvas, sheetrock; canvas, 20 x 20 inches; overall, 62 1/2 x 20 inches. Stockholder’s “[JS 531]” includes such disparate ingredients as a sapling’s trunk and roots, metal strips, zip ties, metallic fabric hanging from a hook, acrylic paint, and bits of plastic. The plastic, fabric and paint create a mini-totem above the sapling’s roots, and the metal strips sprout scissor-like from the top of the trunk, simultaneously evoking a spiritualist celebration of nature and industrial society’s alienation from it. The most hyperactive installation in the show is Beni Bischof’s “Omi im Bregenzer Wald (Granny in Bregenzer Forest)” (2012), a heavily impastoed oil on canvas surrounded by a galaxy of multi-colored, spray-painted circular blots. The canvas’s base coat — squiggly waves of pink, blue, green, yellow, orange and purple — is scraped and smeared, so that the swirling mounds of paint forming Granny’s profile seem to float above it, a fractious combination that pushes Chaim Soutine’s painterly expressionism to spatial extremes, as well as the outer limits of legibility. 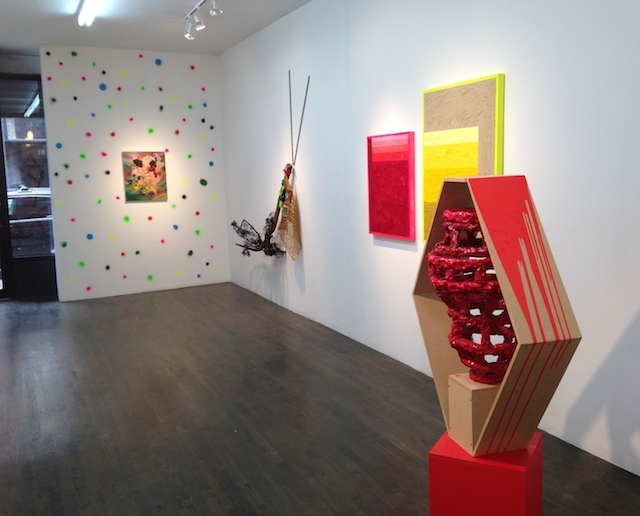 The colors of the spray-painted blots ricochet around the room, from the wooden triangles making up Ryman’s relief on the opposite wall, to the fluorescent pink and yellow-green borders of Tyler’s intensely colored, thickly painted geometric abstractions, which feature gradated bands of red in the painting with the pink border (“DRGC,” 2014) and bands of yellow in the other (“YDC,” 2014). Tyler’s “YDC” is dominated by a clay-like ocher that corresponds to Brion Nuda Rosch’s freestanding wood sculpture, “A Meal and a Drink (ceramics and craft cocktails are all the rage)” (2014). It is interesting that Rosch, as the show’s curator, has delivered the most restrained work, at least in terms of color, while putting together the most heterogeneous mix of materials (including a framed photograph, a drinking glass and a sprig of fresh rosemary — all of which, unlike the parts of the Stockholder, retain their own identity and resist being subsumed into the gestalt). 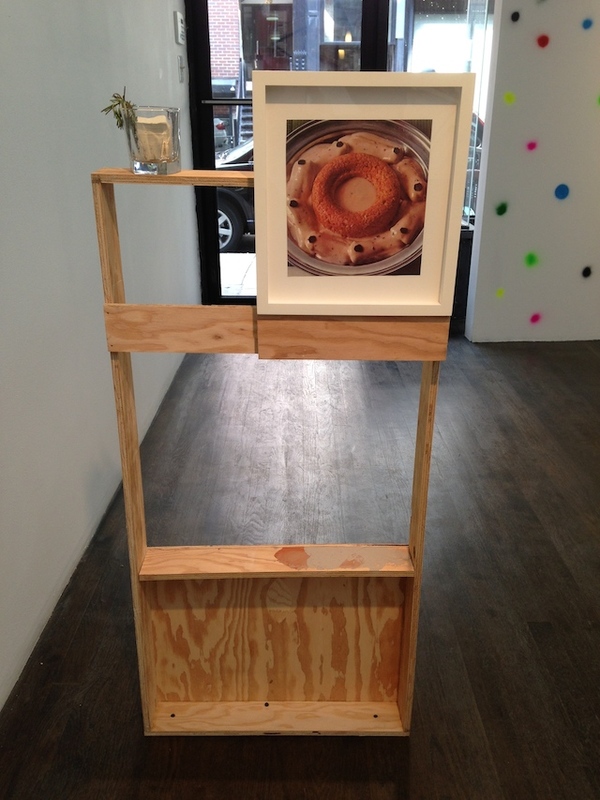 Rosch’s piece is uncategorizable: a work of art that also functions as a shelf for the glass (which holds the rosemary as well as a clay cube) and an armature for the photograph (which appears to depict a donut-shaped rice cake atop a bowl cream-covered wafers). On the back, the sculpture’s base is covered in swipes of burnt sienna, dusty rose, black, and clayish gray paint. Brion Nuda Rosch, “A Meal and a Drink (ceramics and craft cocktails are all the rage)” (2014), acrylic, wood, found book page, plexiglas, glass, clay, rosemary, 45 1/2 x 19 3/4 x 4 1/2 inches. Wholly enigmatic, “A Meal and a Drink” is also paradigmatic of the openness, in content as well as intent, that marks all the works in the show. The circular red ribs that make up the urn-like form of Cherubini’s “Morning Star” reflect the looping vase handles and linear flowers in Nichols’s still lifes; the figure/field spatial disparity in Bischof’s “Omi im Bregenzer Wald” is also found in Trudy Benson’s “Yes, and…” from 2014 (evidently a play on Yes, but…, Dore Ashton’s classic study of Philip Guston’s late work, published in 1976), where beads of yellow paint resembling wads of chewed-up chewing gum seem to drift above a receding gray and green field, which is bordered in peach-and-gray shards intersecting with black-and-white stripes. 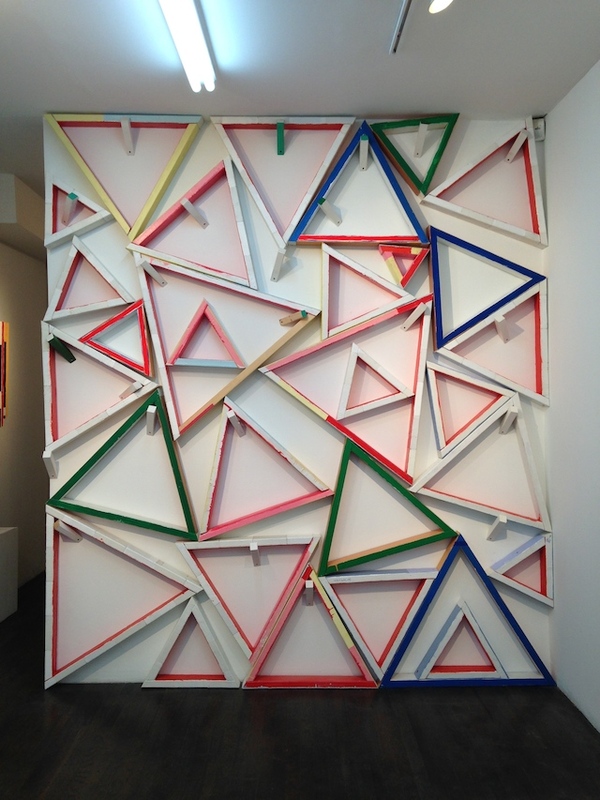 Ryman’s wall relief of triangular frames is open by definition; his “Frame Coil” (2013), a spiral of white-painted wood scraps with glimpses of the wall peeking through, and “Rickshaw,” a tiny, marvelously compressed work in encaustic and wood, are both paintings and sculptures. Rosch cannily surrounds “Rickshaw” with a wide swath of empty space, which its densely painted red, white, pink and black facets have no trouble activating. OK Great REALLY this is ALSO RIDICULOUS continues at DCKT Contemporary (21 Orchard Street, Lower East Side, Manhattan) through August 22.